Make every dinner a special affair with elegant stainless steel flatware from CKB Products. Now you can dress up the dinner table everyday and not spend a fortune in the process when you turn to CKB Products for your stainless steel flatware. We sell wholesale flatware in gold, silver and stainless steel. 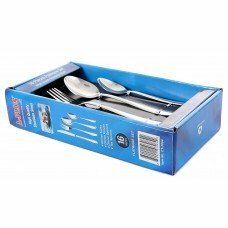 Choose from a variety of wholesale flatware sets in configurations of 20, 51, 60 or 70 piece sets. Give every dinner experience the royal treatment. Order today!